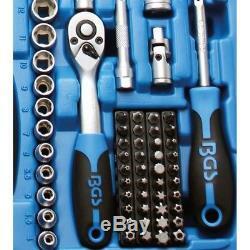 BGS technic Germany 192-Piece Trade Quality Professional Sockets Reversible Ratchet Tool Set! Free Sydney Metro Deliveries Now Available! 3 Reversible 72 Tooth Ratchets!! MASSIVE 1 92 -Piece Tool Set!! PLUS FOR A LIMITED TIME ONLY YOU WILL RECEIVE. 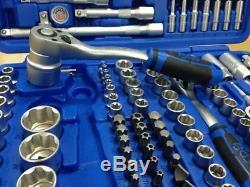 Reversible Ratchet, 6.3 mm (1/4) drive. 12 sockets, 6.3 mm (1/4) drive, Pro torque® 4 - 4,5 - 5 - 5,5 - 6 - 7 - 8 - 9 - 10 - 11 - 12 - 13 mm. Bit sockets, 6.3 mm (1/4) drive, T-Star (for Torx) T10 - T15 - T20 - T25 - T30. Bit sockets, 6.3 mm (1/4) drive, cross slot PH1 - PH2. Bit sockets, 6.3 mm (1/4) drive, slot SL 4 - 5,5 - 7 mm. Bit sockets, 6.3 mm (1/4) drive, internal hexagon 3 - 4 - 5 - 6 mm. 6- point Super Lock Sockets! And Lots & Lots More! Unique 3 in 1 Socket Set, Will do most jobs out there! 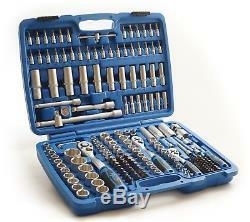 Top Quality Heavy Duty Professional Mechanic's Set! 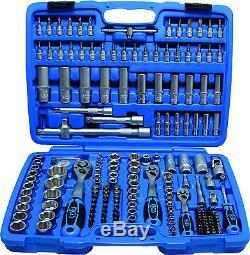 3 Sets in 1, everything you need right there, no more scattered tool boxes! All parts made of chrome-vanadium steel - hardness and torque in accordance with DIN - Super Lock sockets (wave profile type) - drive: 1/4", 3/8 and 1/2 - fine-toothed ratchet, 72 teeth - includes following tools: - with 1/4" drive - 1x reversible ratchet - 1x sliding bar - 1x extension bar 50 mm - 1x extension bar 100 mm - 1x universal joint - 1x handle 150 mm - 13x sockets 4-4,5-5-5,5-6-7-8-9-10-11-12-13-14 mm - 7x deep sockets 4-5-6-7-8-9-10 mm - 5x E-type sockets E 4-5-6-7-8 - 1x bit holder für 1/4" bits - 6x philips bit sockets PH 0-1-2, PZ 0-1-2 - 4x slotted bit sockets 4-5.5-6.5-7 mm - 4x int hex sockets 3-4-5-6 mm - 8x T-star bit sockets T8-9-10-15-20-25-27-30 - 8x T-star bit sockets (tamperproof) T8-9-10-15-20-25-27-30 - with 3/8" drive - 1x reversible ratchet - 1x extension bar 125 mm - 1x universal joint - 1x glow plug socket 18 mm - 10x sockets 10-11-12-13-14-15-16-17-18-19 mm - 6x deep sockets 10-11-12-13-14-15 mm - 5x E-type sockets E10-11-12-14-16 - 1x bit holder for 8 mm bits - with 1/2" drive - 1x reversible ratchet - 1x extension bar 125 mm - 1x extension bar 250 mm - 1x sliding bar adapter for 1/2" extension bar - 1x bit holder for 8 mm bits - 1x universal joint - 2x glow plug sockets 16 - 21 mm - 17x sockets 10-11-12-13-14-15-16-17-18-19-20-21-22-24-27-30-32 mm - 5x deep sockets 16-17-18-19-22 mm - 3x E-type sockets E18-E20-24 - bits with 8 mm drive - 3x slotted bits 8-10-12 mm - 4x cross slotted bits PH3-PH4-PZ3-PZ4 - 5x int. Bits 7-8-10-12-14 - 6x T-star bits T40-T45-T50-T55-T60-T70 - 6x T-star bits (tamperproof) T40-T45-T50-T55-T60-T70 - bits with 1/4 drive - 10x T-star bits T5-T6-T7-T10-T15-T20-T25-T27-T30-T40 - 8x T-star bits (tamperproof) T7-T10-T15-T20-T25-T27-T30-T40 - 5x Ribe bits M5-M6-M7-M8-M9 - 3x spline bits M5-M6-M8 - 8x TS-star bits TS10-TS15-TS20-TS25-TS27-TS30-TS40-TS45 - 4x philips bits PH3-PH4-PZ3-PZ4 - 2x internal hexagon bits H2-H2.5 - 7x allen key 1-1.5-2-2.5-3-4-5 mm. Brand new in blow mold hard plastic case. Anything less is a compromise! When only the best will do! Hardness and torque in accordance with DIN. Super lock sockets too many to list! - 3 fine 72 tooth reversible ratchets - 1/4, 3/8 and 1/2 drive. Weight - 8.75kg (Heavy). Local pick-ups are not available! Unsatisfied in any way, we have 100% good feedback and would like to keep it that way! All our products are manufactured to match or exeede DIN standards, we stand 100% behind every. Please ask prior to sale. 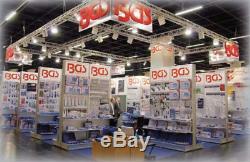 The item "BGS Germany 192-pcs 1/4 3/8 1/2 Reverse Ratchet Wrench Metric Bit Socket Set" is in sale since Monday, December 13, 2010.